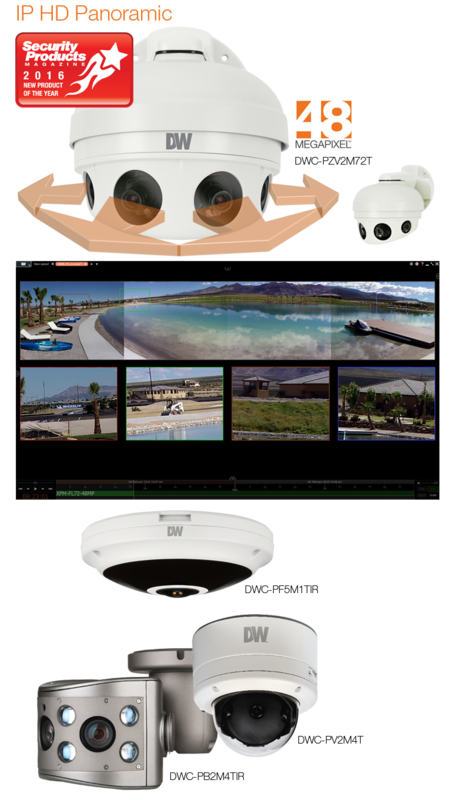 180° and 360° Panoramic Views at 30fps! DW® MEGApix® PANO™ 180° View Cameras are the first multi-sensor cameras in the industry to deliver full frame HD video streams at up to 30fps. They are available in resolutions of 1080p and the World's First 48 Megapixel Camera (4x12MP sensors). Operating as several cameras in a single housing, HD multi-sensor cameras allow you to see more with a single installation, reducing all related costs, such as cabling and labor. The MEGApix® PANO™ IR bullet camera is unequaled in the industry for day/night performance in an IP66-rated enclosure. The Easy-Adjust™ dome camera is simple to mount and adjust — the gimbal rotates in two directions, adjusted WITHOUT OPENING THE DOME! MEGApix® PANO™ Hemispheric 360° View Fisheye Cameras allow you to monitor an entire room with a single camera, providing the ultimate ROI. The ultra-wide 1.55mm fisheye lens produces up to 5MP real-time, wide panoramic or hemispheric images of any scene in any lighting environment. The cameras are optimized to work with DW Spectrum™ IPVMS, offering the software’s powerful dewarping and fisheye handling features. With MEGApix® PANO™ cameras, see true panoramic views without missing frames. When comparing overall system cost, these may be the most cost-effective cameras you can buy because they do more from a single installation.